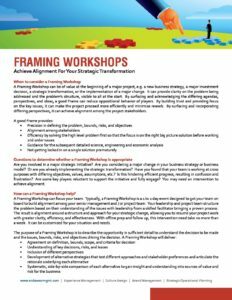 A Framing Workshop can be of value at the beginning of a major project (e.g., a new business strategy, a major investment decision, a strategic transformation, or the implementation of a major change). It can provide clarity on the problem being addressed and the problem’s structure, visible to all at the start. By surfacing and acknowledging the differing agendas, perspectives, and ideas, a good framing workshop can reduce oppositional behavior of players. A framing workshop can build trust and provide focus on the key issues to make the project proceed more efficiently and minimize rework.